Beau and I are always looking to be inspired in life, design, art, and food. One of my favorite moments working on a design job is right after you first meet your client and you have heard what they would like to achieve on their project. You walk away and your brain is swirling around thinking of great concepts. As soon as I return to my desk I would hit the fashion and design magazines, coffee table books, art books, and the internet to find images that convey my vision. I usually can’t sleep because I am so excited. The best inspiration for me and my designs is… seeing the world! I have decided to take a lead from some of my favorite design blogs like Design Sponge, Coco + Kelley, and my girl Casey over at K.I.D Collective and share some color stories. I love the color stories these girls have been producing but I want to give you an international version. So this is my chance to show you the colors, textures, and items that have inspired me and my design style through our travels. So this will now be a regular addition to The World Effect blog. Our first stop is San Miguel de Allende (SMA), Mexico. SMA means the world to me because this is where Beau and I were married. It also means the world to me because it is such an inspiring town. 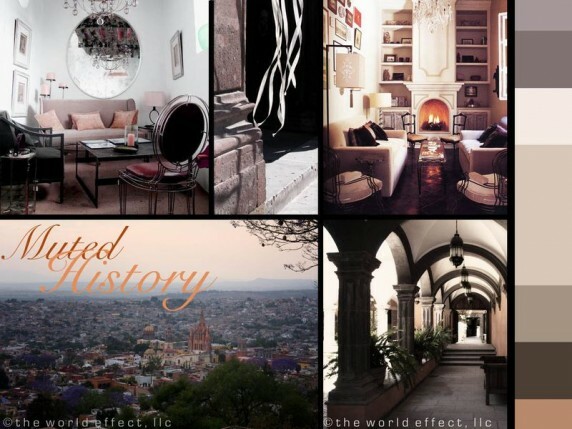 San Miguel de Allende has such a strong personality to it. The city is alive with creative artists, musicians, designers, and people that love to live life to the fullest. The walled streets are finished with bright colors but I am always more excited to see what is behind the large solid wood doors. 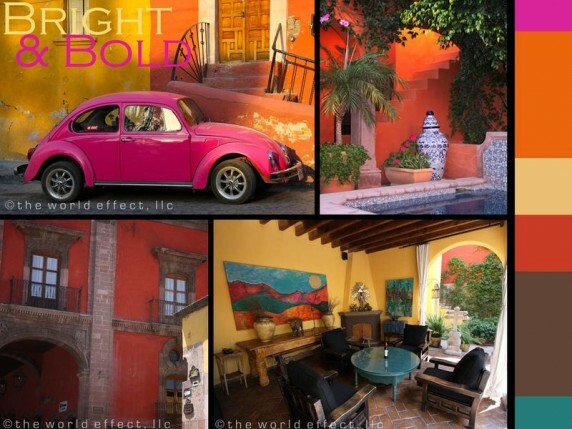 Many of the Casas in SMA are filled with saturated colors that are boldly paired in unique and unexpected ways. I love the bright and bold colors of SMA but it is sometimes hard to see bringing those colors back from your vacation to the walls of your home. SMA also has a very soft and elegant side to it as well. When I walk the cobble stone roads of SMA, I am filled with the romance of history through muted colors and distressed woods. The colors of the old San Miguel de Allende give me a calm and reflective feeling. I am biased since this is close to the color palette in our home but I think this is a great way to bring SMA home with you! Image 1 from Casamidy. Image 3 from Oasis San Miguel. Are you trying to bring an international flare into your home? The travel-inspired-design post will be jumping around the world in no pattern. So if there is something you want to see to help you design definitely send us your request!